THE KING'S CONSORT is one of the world's leading period instrument orchestras. Founded in 1980 by Robert King, The King's Consort and its equally renowned Choir of The King's Consort have toured in five continents and appeared in almost every European country, in Japan, Hong Kong and the Far East, as well as North and South America. With more than one hundred CDs in the catalogue, selling in excess of one and a half million copies, The King's Consort is one of the world's most-recorded historical instrument orchestras. TKC now records for the VIVAT label. TKC's highly-acclaimed recordings have won many international awards and sold over 1,500,000 copies. The orchestra is especially regarded for its many recordings of music by Handel and Purcell, but its catalogue also includes instrumental and choral music by dozens of composers from Albinoni to Zelenka, including Bach Mass in B Minor, Rossini Petite Messe Solennelle, Mozart Sacred Music, the Stabat Maters of Pergolesi, Astorga and Boccherini, and the massive Venetian reconstruction Lo Sposalizio. Twenty-five world-première recordings of Purcell's complete Odes, Solo Songs and Sacred Music established TKC as the world's leading performers of this composer's music. TKC is also renowned for its recordings of more than a dozen Handel oratorios and operas. Other CD projects include the much acclaimed Sacred Music of Monteverdi, including the Vespers of 1610: this series follows the success of ten volumes of Vivaldi's complete Sacred Music. Similarly fêted have been the best-selling recordings of The Coronation of King George, Handel's colourful Ode for St Cecilia, the critically-acclaimed Michael Haydn Requiem (winner of BBC Music Magazine’s 'Best Choral Recording') and Mozart Sacred Music with soprano Carolyn Sampson. TKC now records for the VIVAT label. An extravagant, critically acclaimed world-premiere recording of sacred music by Stanford and Parry, I was glad, was a Gramophone Awards finalist, and has been followed by discs of music by Couperin, Monteverdi, Handel arias with Iestyn Davies, two glorious discs of Purcell chamber music, Mendelssohn’s extraordinary 1833 reconstruction of Handel’s Israel in Ägypten and, most recently, a recording British Romantic choral masterpieces, A Voice from Heaven. 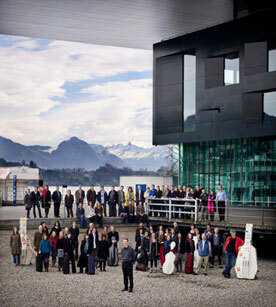 Recently TKC has enjoyed major European tours of Bach St Matthew Passion, Handel Messiah and Bach Mass in B minor and The Coronation of King George, performed the Requiems of Mozart and Michael Haydn in Lucerne, Mendelssohn Paulus at Leipzig Gewandhaus and at Enescu Festival in Bucharest, Haydn The Creation at Flanders Festival, Handel Messiah widely across Europe, Finzi Dies Natalis and Britten Les Illuminations in Wigmore Hall and in France, Purcell The Fairy Queen, King Arthur and Dido and Aeneas in Theater an der Wien, Mendelssohn’s 1833 version of Handel Israel in Egypt at Leipzig Gewandhaus and the festivals of Rheingau and la Chaise-Dieu, Vivaldi Juditha triumphans in Vienna, Amsterdam Concertgebouw and Versailles,alongside tours to Austria, Belgium, Denmark, France, Hungary, Malta, Mexico, the Netherlands, Portugal, Romania, Spain and Switzerland.